This Japanese yukata celebrates the seasons. Set against a distinctive black and blue background, diamond shaped calligraphy symbols decorate the robe in black, gold, blue and white. The calligraphy reflects the seasons of spring, summer, fall, winter and elements of snow and the moon. Made in Japan of soft 100% cotton with a shrink resistant finish. A matching belt is included. Easy care cotton, machine wash cold for best results. 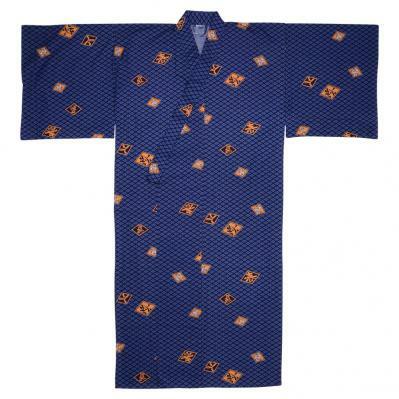 This yukata is available in three sizes: Medium, Large and XL. Medium, measures 58" length and is designed to fit a man 5' 8" to 6' in height. The sleeve length is 15", the shoulder width is 27" and the girth is 50". Large, measures 60" in length and is designed to fit a man 5' 9" to 6' 2" in height. The sleeve length is 15", shoulder width is 27", the girth is 52". XL, measures 62" in length and is designed to fit a man 5' 10" to 6' 6" in height. The sleeve length is 15", shoulder width is 27", the girth is 54".